It is with great sadness that we announce the passing of Teresa Elizabeth Smith at the age of 99 years. Teresa passed away with family by her side. Most recently from Carleton Place, Ont., previously from Ottawa, Ont. Left to mourn and remember are her sister Frances (Charles) Unkovic and her brother Charles (Marie) Murray, as well as many nieces, nephews, great nieces and great nephews. Teresa is pre-deceased by her parents Mary and Charles Murray of Metcalfe as well as brothers Matthew, Gerald, George, Bernard and sisters Isobel and Mary and husband, Paul Smith. Teresa was a life-long learner with vast interests, particularily in geneology. Her brilliant mind was matched only by her hard working hands; hands that always gave in service without hesitation. Her tireless dedication to volunteerism was appreciated particularly by her service to the Ottawa Royal Hospital, and the Bytown Museum where she was recognized with a lifetime membership for her hard work and contributions. Her varied interests included gardening, sewing, quilting, cooking, and reading. 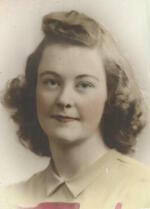 She belonged to a great number of organizations including The Ottawa Women’s Candian Club, The Historical Society of Ottawa, The Osgoode Township Historical Society and the British Isles Family of Greater Ottawa. She will be profoundly missed by her niece Caroline and her husband Jim (Hicks), as well as their children James, Emily, Isobel and Matthew who have had the great pleasure of living with her this past year and whose lives were enriched by her presence. Her kind and gentle spirit will be greatly missed. A funeral mass will be held at St. George’s Parish, 415 Piccadilly Avenue, Ottawa on Friday April 12, 2019 at 11am. Family and friends are welcome to attend a luncheon following the funeral mass in the Reception Hall at St. George’s Parish. (No visitation at the request of the deceased). Spring internment to follow at a later date. In lieu of flowers, donations would be appreciated to The Royal Ottawa Hospital.